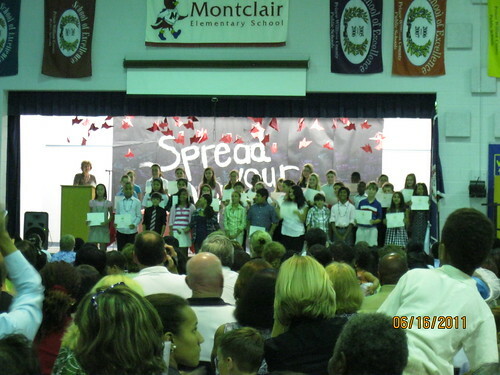 Tuesday I attended the Saunders 7th grade awards ceremony. Of the 300+ kids in the class there were 25 or so there. Three awards were given out. One for "No Zeroes" which meant no missed assignments all year. Another for "$100 all year." This school has a system where all kids start with an imaginary $100. For misbehaviour, not being prepared, etc., they can have dollars "lost" on their record sheet each quarter but start each quarter with a new $100 sheet. There are quarterly awards for those with $75 or higher. The third award was a plaque for straight As all year. Rebecca earned all three and dressed up for the day, except she went to Art class instead of to the ceremony so I received her first two awards before she made it to the hall. Awesome. She didn't let me keep the movie or McDs gift cards though. Hmph. The day after, Becca heard she's accepted into the Signet program (our "G/T" program... ugh, I really don't like that term) for next year, and has been taken on as a musical theater apprentice for a 2-week class this summer. It's definitely taken the sting out of being shunned from NJHS! 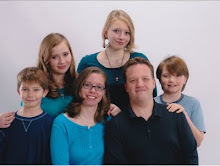 Now all 4 kids are in the Signet program, Katherine by virtue of the IB program at Gar-Field and the rest by nominations from their teachers and testing. Anything to break up the doldrums of regular school work here. On Thursday night, Nicholas had his 5th grade promotion. This is the first time we've had something like this, all the other schools the kids have attended were K-12, so "graduating" 5th grade wasn't really a big deal as the kids would just move over a few classrooms or a hallway to start Middle School. Here, it's a Big Deal. 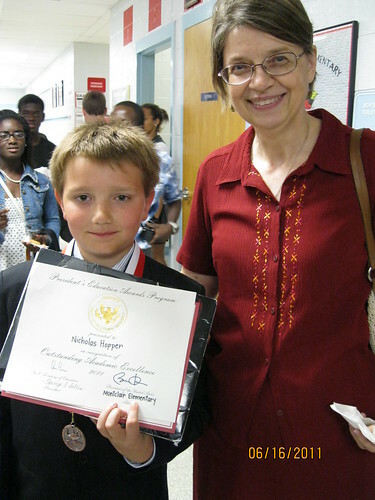 And as a surprise to us all, he earned the President's Academic Excellence award for his marks in 4th and 5th grade. Doesn't he look awesome? The boy rocks a suit. We were really far back and the lightning is horrible in the cafetorium, but he's in with the group of Academic Excellence recipients on the right, covering his face with the paper. WARNING: Please only listen to the following clip if you don't mind your ears bleeding or if your ears are already bleeding due to your own elementary strings player. No matter what, we're proud of our kids, but this week has truly been exceptional. How can two siblings be so very very different?